One of the earliest pair of stays in this country with known provenance is held at Pilgrim Hall in Plymouth, Massachusetts. Through family history the stays have been attributed to Mary Chilton Winslow, a Mayflower passenger. The stays were dated in 1993 by Janet Arnold to 1670. 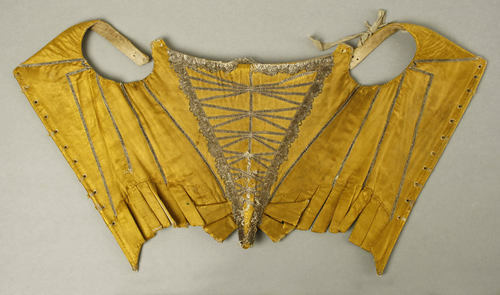 Originally covered in yellow silk satin, only fragments of the outer silk covering remain on the fingers (tabs), with all of the internal construction visible. The eyelet holes at center back are completely gone on the proper left and partially destroyed on the proper right. The upcoming exhibit "What's Under Colonial Things" opening May 28, 2011, prompted the recreation of the stays as they might have appeared when worn. The first step in the process was close examination of the original stays and patterning the stay pieces. Each pattern piece was then traced onto mylar. A practice version was sewn to make sure the pattern pieces fit together. This practice version was also used to help build the mounts which would be used to display both the reproduction and original stays. The pattern pieces were drawn onto sturdy linen canvas. The original canvas is lighter in color and less dense in weave than the reproduction, but since the type of canvas used in the originals is unobtainable, the first compromise had to be made. I have been using Ulster Linen for many years as the foundation layer for 18thc stays and decided to use that, since I had success with it for the later time period. It is unbleached (brown) linen. Linen thread 40/2 twist was used to sew the channels. The linen thread used to sew the originals was closer to a 20/2 twist but since my linen was more dense, I went with the smaller size thread (second compromise). Heavy waxing of the thread was necessary to prevent fraying. The decision to hand sew each channel was made. The process of laying in thread as the channels are sewn, adds to the strength and integrity of each piece. Since the boning product was the third compromise, handsewing the channels would provide the most effective replication. Each piece took approximately 8-12 hours of hand sewing the channels and there were 9 pieces in all. After sewing all the channels the seam allowance on each piece was turned to the inside and whipped down to the boned channels. Each piece was then placed wrong sides together and sewn with a joining stitch. The most interesting construction note of these stays is that the rough seam allowance was to the fashion fabric and the smooth side to the body. On the original stays, decorative tape trim still survives on the fingers and there is no doubt as to which is the right and wrong side of the stays. It was very important to join the pieces in the manner of the original in order to achieve the proper shaping. This is the wrong side of the stays. In 18th century staymaking this is the RIGHT side! The artificial whalebone made a solid and sturdy foundation. This is the right (fashion fabric) side of the stays, soon to be covered in yellow silk. The stays nearing completion after being covered with yellow silk. Each finger (tab) was lined first and then the body of the stays was covered with the silk. The seams are lapped facing towards center back. The lapping of the seams allow for a smooth fit over the curves of the stays, especially at center front. The front 5 tabs on either side of center front were covered in decorative tape as was the original. Since the yellow silk was missing on the body of the stays, the decorative arrangement on center front was influenced by a pair of stays held at the Metropolitan Museum of Art in New York. Front view while attaching shoulder straps. For display purposes the shoulder straps were wired in order for them to stand proud of the garment and simulate the wearer. Silk ribbons were chosen to tie the shoulder straps on the garment. Safely mounted and delivered to the museum. Side by side with the original.